BETTER PRODUCTION Shops Using Technology 94 MMS January 2017 mmsonline.com s t e e l s , a i r c r a f t s t e e l s , h i g h - t e m p e r a t u r e alloys and titanium. Its aircraft/aerospace work encompasses cargo-handling systems, floor supports and airframe components, as well as brackets and other smaller parts. In addition to aerospace work, Fort Walton Machining produces m e d i c a l e q u i p m e nt p a r ts a n d d o e s g e n e ra l machining work. While jobs can be diverse, the common denom- inator is the high level of required quality and precision. The company must provide these, along with fast deliver y, to stay ahead of the competition. One way it does this is by investing in advanced technology. "If we aren't on the cutting edge technology- w ise, our c omp etition w ill r un r ight ove r us. Advanced technology is everything to our busi- ness," says Tim McDonald, production manager. The lion's share of the company's machine tool technology is from Mazak. 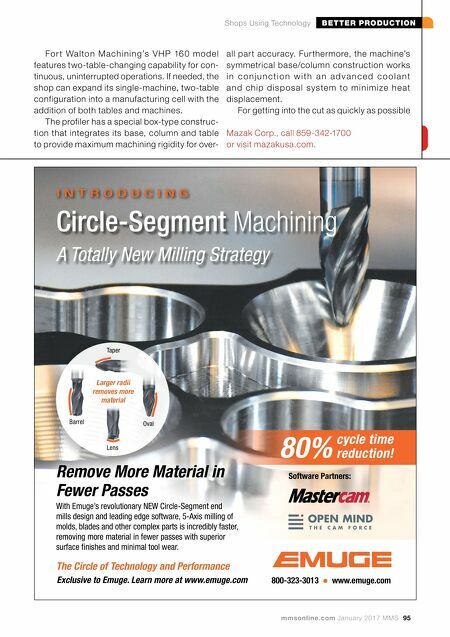 Its more than 20 Mazak machines include various models of Quick Turn Nexus multitasking machines, Variaxis five- axis vertical machining centers, Slant Turn Nexus turning centers and Vertical Center Nexus machin- ing centers. 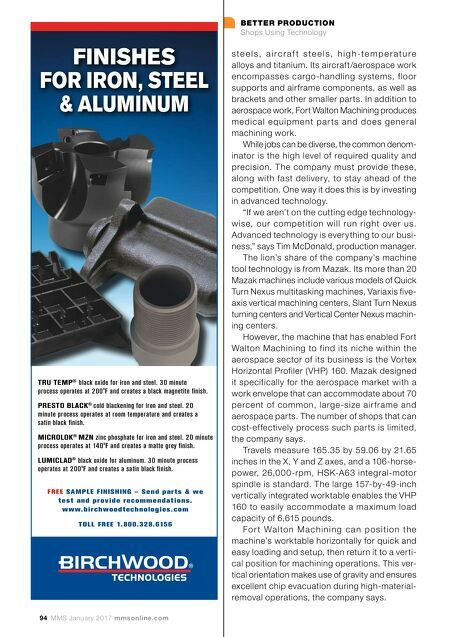 However, the machine that has enabled Fort Walton Machining to find its niche within the aerospace sector of its business is the Vor tex Horizontal Profiler (VHP) 160. Mazak designed it specifically for the aerospace market with a work envelope that can accommodate about 70 percent of common, large-size air frame and aerospace parts. The number of shops that can cost-ef fectively process such par ts is limited, the company says. Travels measure 165.35 by 59.06 by 21.65 inches in the X, Y and Z axes, and a 106-horse- power, 26,000-rpm, HSK-A63 integral-motor spindle is standard. The large 157-by-49-inch vertically integrated worktable enables the VHP 160 to easily accommodate a ma ximum load capacity of 6,615 pounds. F o r t Wa l to n M a c h i n i n g c a n p o s i t i o n t h e machine's worktable horizontally for quick and easy loading and setup, then return it to a verti- cal position for machining operations. This ver- tical orientation makes use of gravity and ensures excellent chip evacuation during high-material- removal operations, the company says. FINISHES FOR IRON, STEEL & ALUMINUM FREE SAMPLE FINISHING – Send parts & we test and provide recommendations. www.birchwoodtechnologies.com T OLL FREE 1.800.328.6156 TRU TEMP ® black oxide for iron and steel. 30 minute process operates at 200 o F and creates a black magnetite finish. PRESTO BLACK ® cold blackening for iron and steel. 20 minute process operates at room temperature and creates a satin black finish. MICROLOK ® MZN zinc phosphate for iron and steel. 20 minute process operates at 140 o F and creates a matte grey finish. LUMICLAD ® black oxide for aluminum. 30 minute process operates at 200 o F and creates a satin black finish.